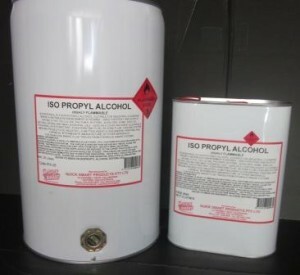 Isopropyl Alcohol also known as IPA dissolves a wide range of non-polar compounds. It also evaporates quickly and is relatively non-toxic, compared to alternative solvents. Thus, it is used widely as a solvent and as a cleaning fluid, especially for dissolving oils. Common uses include cleaning electronic devices, magnetic tape, disk heads and lenses, LCD and glass monitor screens, an alternative to common household cleaning products, is a common whiteboard cleaner, removing adhesives, stain removal and the cleanup of resins and oil-based products such as paint. Please consult the MSDS on Isopropyl Alcohol before use.